I'm back with pictures from another bridal trial. 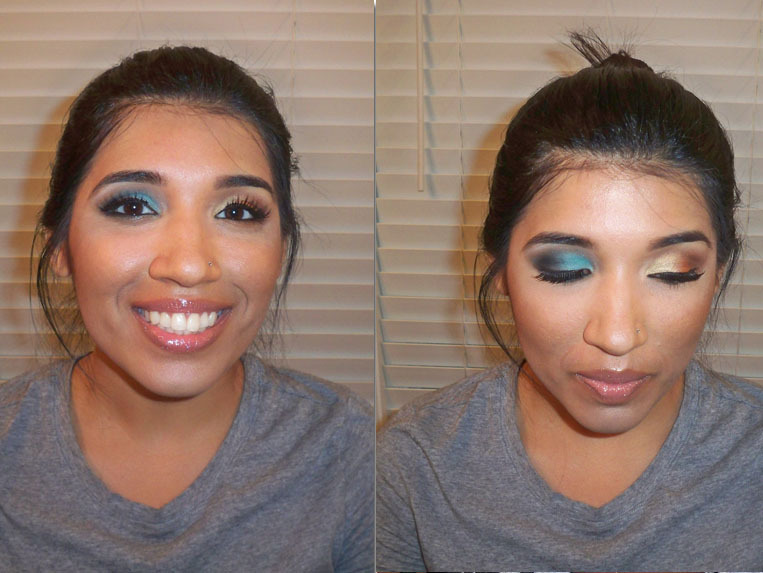 Oftentimes, when I work on Southeast Asian Brides, we'll do more than one look. I've done up to four look changes because their traditional wedding process can last a few days time. Typically, the bride will want something more natural or traditional and then go for a dramatic look. I often ask them to bring a piece of their outfit so that we can get inspiration for the look. In the picture, you'll see both eye looks. For each look, I'll modify the lip and cheek color but the canvas stays the same. One look was for the ceremony. I went for the traditional palette for Indian brides of golds, reds, coppers and bronzes. For the evening, we mixed it up and went for a smokey aqua eye. The wedding is next month. I'll make sure and take pics for you all. I prefere the blue/black one. The right eye looks more like an everyday makeup look. She will be a beautiful bride. I am the gold. it really matches her skin tone and brings out her eyes!! she's so pretty! Great job Ren! I love the aqua smokey eye!